From time to time I have to spend some days in the "lovely" city of Bad Hönningen, a sleepy little town close to Koblenz, as we have a branch office of our company there. This place is definitely out in the sticks, somewhere in middle of nowhere with its boom years back in the 80s. When you've been there a few times you know the menu of the few - hrmmm... in the meantime it's just one - restaurants by mind therefore I decided this time to try something new. Some research in the internet gave me a nice selection of burger joints which're not too far away by car. I tried three four and had the full range from bad to very good, more to follow in the future. Here's my ranking of those I tried recently, I start my ranking with the worst of them. The location itself is nice, easy to reach and has enough free parking... but the food was not as good as I heard it from other: the fries were overpowered with salt and some other spices... the meat was a bit dry (and also not a fresh pattie), the same for the standard bun that you can get in any supermarket. It was ok and definitely better than McD, BK etc. but not worth to go there again. The location changed the owner in the beginning of 2015 and you still can see that it has been a traditional German pub before. The new interior looks good and the ordered burger was... let's say: average. The meat was juicy, not sure if it was a homemade pattie or not, but the standard bun, same type like in the Burgermeisterei, was a bit on the dry side. 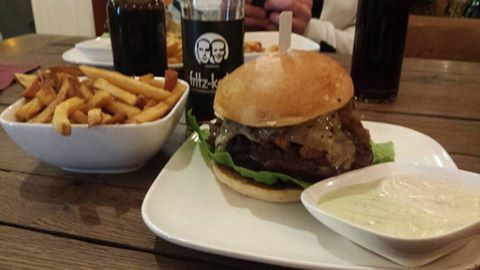 Better then the one at the Burgermeisterei but again not good enough to make you visit that place again. In the middle of the city centre, a bit difficult to find a place for parking but finally it was worth it. Another try and that's definitely a shot in the bullseye! Homemade pattie made of fresh ground beef. A homemade bun, handcut fries! They also have sweet potato fries on the menu! The people at this place know how a good burger should be! They know what they're doing and they're doing a very good job! All their burgers have Western related names like Clint Eastwood, Django, Lucky Luke etc., I decided for the Django Burger with Jalapenos and Nachos. I wasn't disappointed, that's a place I'll visit again! Last but not least, die Fette Kuh. A while ago I had the chance to go there with two friends to try their burgers as I heard a lot of good things about this place. The biggest problem was to find a parking space (which should be a general problem in Cologne), but the big advantage of it was that the row was very short when we arrived to place our order. After a short waiting time we received our medium grilled burger (which is the standard if you order there, no need to ask for it), all served in a fluffy bun with a tasty sauce! I have heard a lot about this place before and I definitely wasn't disappointed. It's a good alternative to the Bad Hönningen nightlife *hahaha*, they also have some nice craft beers and tasty non-alcholic beverages. I really liked the food and I will come back for sure.